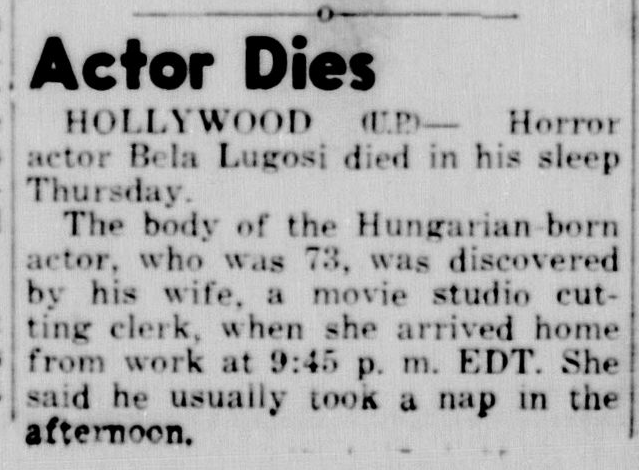 Bela Lugosi died in his sleep at about 6:45 p.m. on Thursday, August 16th, 1956. He was 73. The cause of death was recorded as a coronary occlusion with myocardial fibrosis. His body was discovered by his fifth wife, Hope, in their apartment at 5620 Harold Way, Los Angeles, on her return from work. His funeral was held on Saturday, August 18th. He was interred at Holy Cross Cemetery in Culver City in full Dracula costume. Contrary to popular legend, Bela Lugosi did not express a desire to be buried in his famous costume. It was the decision of his fourth wife, Lilian and their son, Bela G. Lugosi, who believed that it is what the actor would have wanted. Bela Lugosi, who won, international stage and screen fame in the title role of Bram Stoker’s mystery, “Dracula,” died tonight. He was 71 years old. A year ago the Hungarian-born actor appealed for help to Los Angeles County authorities, saying he was a narcotics addict and wanted a cure. He was admitted to Metropolitan State Hospital at Norwalk to begin a three-month rehabilitation course. When he was released, Mr. Lugosi said he was convinced that he had been cured forever. During World War I Mr. Lugosi was a lieutenant in the Hungarian Infantry. He served for more than two years on the Serbian frontier and later in Russia. In 1921, after the war and the political revolution in Hungary, he went to New York. He organized a Hungarian dramatic company in which he was producer, director and star. Mr. Lugosi was born in Lugos, Hungary, on Oct. 29, 1884, a son of an upper-class family. He studied at the Academy of Theatrical Art in Budapest and began his career as an actor in 1900. In 1911 he was leading man at the Magyar Szinhaz, a Budapest theatre, and two years later became leading man at the Royal Hungarian National Theatre. He started playing Shakespearean roles in Hungary and had three years of classical roles, including Ibsen and others. He fled the Communist reign of terror of the post-World War I period, and came to this country, via Berlin. This was during the early Nineteen Twenties. It was followed by his appearance as the Sheikh of Hammam in “Arabesque” at Daly’s Theatre. Many important roles came thereafter, including those of Sergius Chernoff in “Open House,” “Father Petros in “Devil in the Cheese,” and at the Fulton Theatre in this city in October, 1927, as Count Dracula in “Dracula,” which ran throughout the season and was followed by a tour of two years. Mr. Lugosi virtually created the role of Dracula, the mad count who lured victims to his macabre castle in the Hungarian mountains and there turned into a vampire and murdered them. In 1939 he portrayed one of the Communist commissar in the film “Ninotchka,” which starred Greta Garbo. 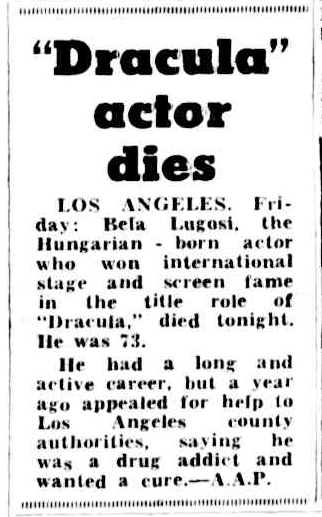 Veteran Hungarian actor Bela Lugosi, 73, best known for his many Dracula screen roles, died late yesterday in his apartment at 5620 Harold Way, apparently the victim of a heart attack. Lugosi’s wife, the former Hope Lininger of Johnstown, Pa., whom the actor once credited with encouraging him to break a drug addiction, told police her husband was dead in bed when she returned home last night. Lugosi’s acting career was interrupted temporarily in 1955 when he turned up at the office of the mental hygiene counselor at General Hospital asking that he be committed because he had been using narcotics for 20 years. He was treated for three months and in the following August passed a rigid staff examination at Metropolitan State Hospital and was released to resume his film career. 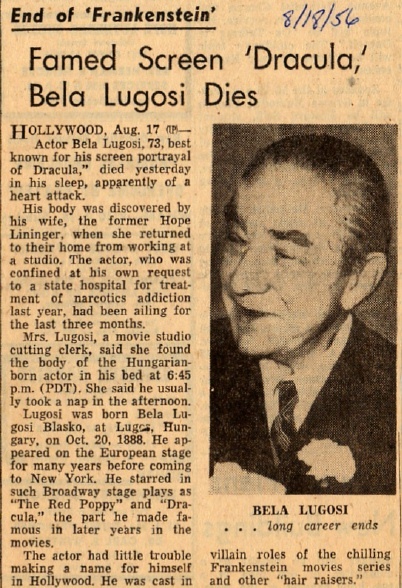 Lugosi commenced work in his last picture, “The Black Sleep,” two weeks later and within another seven days, Aug. 24, 1955, he married Miss Lininger. She had been a long-time fan of his and during his battle against the dope addition had written him repeatedly of her belief that he would properly rehabilitate himself. She was his fifth wife. Last night she said: “We have been very happy together. He seemed to be getting much better month by month, and it was a great shock to me to find him dead when I entered the house. Lugosi was born at Lugos, Hungary, and started his acting career in 1900 in Europe. He made his American film debut in 1924. He brought the Dracula role to Hollywood after a successful two years starring role in the stage production. During the early vogue of horror films Lugosi was considered with Boris Karloff and the late Lon Chaney to be one of the peers in portraying supernatural characters. HOLLYWOOD (AP) – Bela Lugosi famous for his portrayal of the “Dracula” on stage and screen, and only recently conqueror of himself after 17 years of drug addiction, died late yesterday of natural causes. He was 73. After a long and active career in motion pictures, the Hungarian-born actor surrendered himself to Los Angeles authorities last year, saying he was a hopeless drug addict and wanted a chance of rehabilitation. He said he had started taking demerol in England in 1938 and never had been able to completely free himself from the use of drugs in one form or another. Lugosi’s second wife, the former Hope Lininger of Johnstown, Pa., said she found him dead when she returned home from work. They were married last August. She had encouraged Lugosi to appeal for help in his fight against drug addiction, and he said she was the inspiration for his decision to enter hospital. “We had been very happy together,” she said. “It was a shock to find him gone. He was improving little by little, and there was no inkling of his passing.” An autopsy has been ordered. Lugosi’s first wife was Lillian Arch, by who, he had a son, Bela Jr. They were divorced in 1953. LOS ANGELES (AP) – Death Thursday night claimed Bela Lugosi, who won international stage and screen fame in the title role of Bram Stoker’s mystery, Dracula. He was 73. The Hungarian actor had a long and active career but a year ago he appealed for help to Los Angeles county authorities, saying he was a drug addict and wanted a cure. He was admitted to hospital to begin a three-months rehabilitation course and when he was released he said he was convinced that he had been cured forever. Lugosi told authorities he had become an addict in England 17 years before and thereafter was never completely free from the use of drugs in one form or another. HOLLYWOOD (U.P.) – Horror actor Bela Lugosi died in his sleep Thursday. The body of the Hungarian-born actor, who was 73, was discovered by his wife, a movie studio cutting clerk, when she arrived home from work at 9:45p.m. EDT. She said he usually took a nap in the afternoon. Bela Lugosi, who won international stage and screen fame in the title role of Bram Stoker’s mystery, “Dracula,” died in Los Angeles Aug. 16. He was 74 years old. A year ago the Hungarian-born actor appealed for help to Los Angeles County authorities saying he was a narcotics addict and wanted a cure. He was admitted to Metropolitan State Hospital at Norwalk to begin a three-month rehabilitation course. When he was released Mr. Lugosi said he was convinced that he had been cured forever. During World War I Mr. Lugosi was a lieutenant in the Hungarian Infantry. He served for more than two years on the Serbian frontier and later in Russia. In 1921, after the war and the political revolution in Hungary, he went to New York. He organised a Hungarian dramatic company in which he was producer, director and star. This was during the early nineteen twenties. It was followed by his appearance as the Sheikh of Hammam in “Arabesque” at Daly’s Theatre, New York. Many important roles came thereafter, including those Sergius Chernoff in “Open House,” Father Petros in “Devel (sic) in the Cheese,” and at the Fulton Theatre in New York city in October 1927 as Count Dracula in “Dracula,” which ran throughout the season and was followed by a tour of two years. Mr. Lugosi virtually created the rile of Dracula, the mad count who lured victims to his macabre castle in the Hungarian mountains and there turned into a vampire and murdered them. In 1939 he portrayed one of the Communist commissars in the film “Ninotchka,” which starred Greta Garbo. HOLLYWOOD (UP) – Actor Bela Lugosi, 73, best known for his screen portrayal of “Dracula,” died Thursday afternoon in his sleep, apparently of a heart attack. His body was discovered by his wife, the former Hope Lininger, when she returned to their home from working at a studio. The actor, who was confined at his own request to a state hospital for treatment of narcotics addiction last year, had been ailing for the last three months. 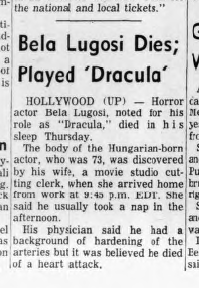 Mrs. Lugosi, a movie studio cutting clerk, said she found the body of the Hungarian actor in his bed. She said he usually took a nap in the afternoon. Lugosi was born Bela Lugosi Blasko, at Lugos, Hungary, on Oct. 20, 1888. He appeared on the European stage for many years before coming to New York. He starred in such Broadway stage plays as “The Red Poppy” and “Dracula,” the part he made famous in later years in the movies. Survivors include his wife and a 17-year-old son, Bela Lugosi Jr., who lives here. HOLLYWOOD – Bela Lugosi famous for his portrayal of the “Dracula” on stage and screen, and only recently conqueror of himself after 17 years of drug addiction, died late yesterday of natural causes. In World War 1 Lugosi served as a lieutenant in the Hungarian Infantry. He came to the United States after the revolution in Hungary and organized a dramatic company. He played the role of a Spanish Apache in “The Red Poppy” and from that gained the lead in Bram Stoker’s mystery, “Dracula.” His film career began in 1931. Bela Lugosi will be buried today wrapped in the black cape of Dracula, the horror character that brought the greatest fame of his long acting career. “It was his wish,” explained his widow, Mrs. Hope Lininger Lugosi. Prior to this dramatic burial, funeral services for the veteran 74-year-old actor will be conducted at 2:30p.m. today at the Utter-McKinley Mortuary Chapel , 6240 Hollywood Blvd. The interment will be at Holy Cross Cemetery. The body will lie in state at the mortuary until an hour before the services. Los Angeles, Aug. 17 (AP) – Bela Lugosi will go to his grave wrapped in the black cape of Dracula, the horror character in which he scored the greatest triumph of his long motion picture career. The 73-year-old stage and screen actor, whose weird roles brought shudders to theatregoers for more than 30 years, was found dead in his home last night. Only last year he extricated himself from a web as horrible as any of his movie plots – narcotics addiction. Lugosi made a fortune portraying vampires, zombies and monsters but friends said he gave away much of his fortune. Mrs. Lugosi delivered the flowing cloak of Dracula to the mortuary and said it was her husbands request that he be buried in it. LOS ANGELES – Bela Lugosi, who won international fame on the stage and screen for the title role in “Dracula,” died Thursday night (16) at the age of 71. The Hungarian actor recently completed a three-month stay at Metropolitan State Hospital at Norwalk for rehabilitation as a narcotics user. When he was released he said he was convinced that he had been cured forever. I ALWAYS want people to live and die strictly in character. 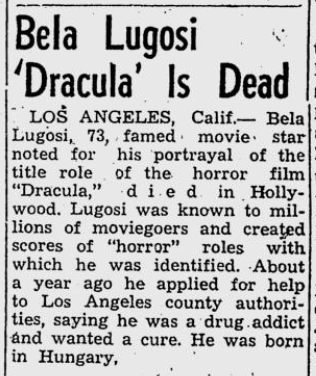 The news that 73-year-old Bela Lugosi, the man who created a really terrifying projection of the vampire Count Dracula, has died a pauper and a drug addict in Los Angeles seems fitting. Maybe if they were revived now Lugosi’s films would cause only laughs. Maybe we are all wiser and more sophisticated these days. But I can tell you when I first clapped eyes on the screen Dracula all those years ago, Lugosi was as convincing and terrifying as a serpent dangling from a tree. And when he transformed himself into a vampire bat and started working his way up the walls of his repulsive Transylvanian castle, you accepted it unquestioningly. It was hokum, but hokum in the grandest style. What an extraordinary life the man led! The origins were a bit like that other splendid old-timer, Eric von Stroheim. Like Stroheim, Lugosi was an officer in the Austro-Humgarian imperial forces during World War One. Like Stroheim, after the swords had been hung up Lugosi came to America. Her hit Broadway in the mid 1920s. In ’27 came the start of the climax – Dracula. I did not see him in it on the stage, but it must have taken tremendous virtuosity to het away with it in the living theatre. But it was the film which really landed him in the select – and highly profitable – company of ghouls, ghosts, werewolves, and robots. Audiences screamed. People fainted. There were complaints of insomnia from the more impressionable. Yes, Dracula was the high spot. The descent was slow – the descent into a private hell of his own. The offers of parts came to a halt. Suddenly the man from Hungary was in his sixties and the shadows were lengthening. In a world of Buchenwald and Belsen it did not make sense to produce horror films any more. To escape from the misery of stony-faced agents, friends who turned their backs, swanky restaurant doormen who told him to “get going, Bud,” Lugosi retreated into a world of dreams which may have been as awful as the other world of which he had given us all a glimpse for three and nine-pence. Cheap lodging houses. The phone which never rang. Drugs. “Forever,” as far as Lugosi was concerned, meant just eight months more. Yes, it’s amazing how many errors are contained in the obituaries, isn’t it. Shockingly poor journalism! I have been researching our family history genealogy and found that Bela Ferenc Dezso Blasko was a first cousin, once removed, of my husband Richard Edward Blasko, now deceased. Bela changed his last name professionally to Lugosi, which is the name of the town Lugos, Banat, Austria-Hungry which is now Lugoj, Hungry, Romania, where he was born on October 20, 1882. Bela was a gifted performer who began his career with the Budapest-based National Theater of Hungary as a Shakespearean actor. In 1914, Bela voluntarily enlisted in the Austro-Hungarian Army as a lieutenant serving in the Carpathian mountains and was wounded three times. Bela suffered a lifetime of pain from his military injuries. 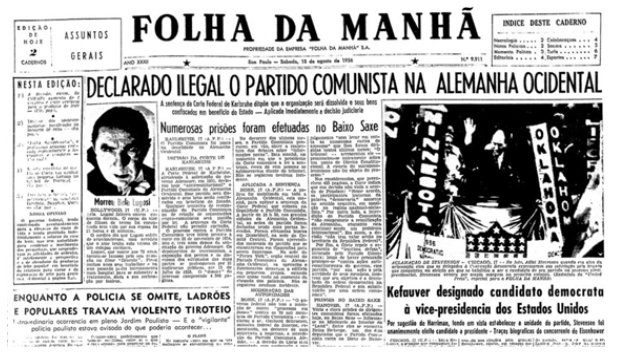 Bela emigrated to the United States in 1920. It was in 1927 that Bela was cast in the role of Dracula at Universal studios. 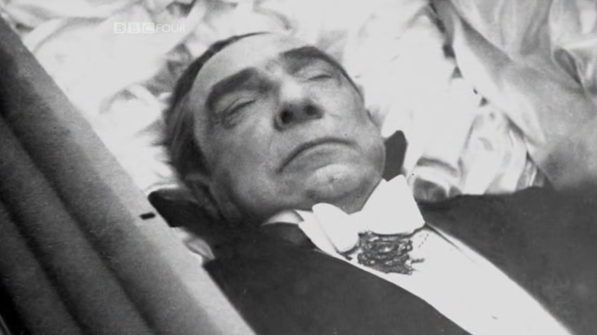 Bela was also offered the role of Frankenstein but turned it down. The part was then offered to a little-known actor named Boris Karloff. In 1934 Bela and Boris were cast in “The Black Cat” their first of five films together. Because of his heavy accent, and lack of the English language it was difficult to cast Bela in romantic leading roles. Bela loved soccer. In 1935 Bela was named Honorary President of the Los Angeles Soccer League. Bela’s hobby was stamp collecting of which he owned over 150,000 stamps. Bela was honored by the United States Post Office when in 1997 they issued a 32 cent commemorative Dracula postage stamp. 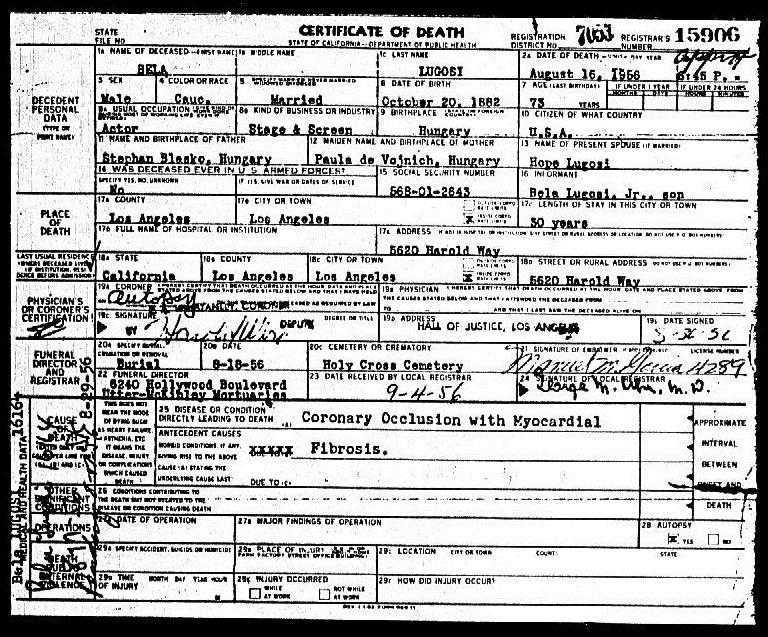 Bela Lugosi died of a heart attack on August 16, 1956 at the age of 73 and is buried under a simple gravestone at Holy Cross Cemetery, Culver City, Los Angeles County, California. We are very proud of Bela, his film legacy and the Count Dracula character he portrayed. 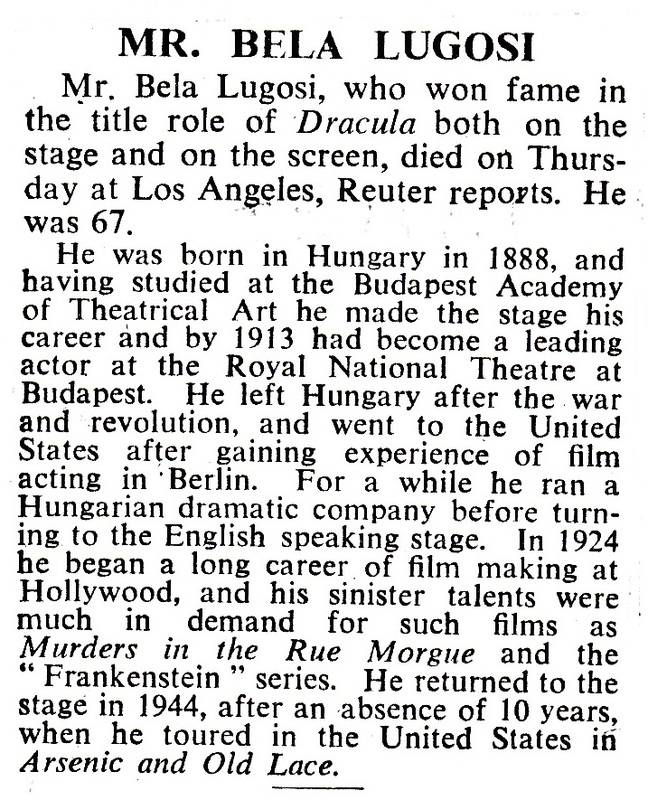 Bela Ferenc Dezso Blasko (Lugosi) is remembered and loved. That’s fascinating, Rosemary. It must be such a thrill to learn that Bela is a member of your family. Please do let us know if you uncover any interesting facts about Bela and your family tree.